Chris Hadfield is nominated for his picture book The Darkest Dark and Gord Downie for his graphic novel collaboration with Jeff Lemire Secret Path. 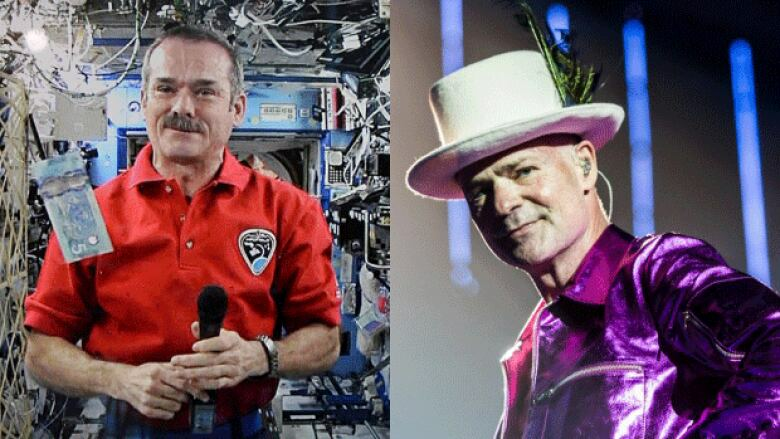 Canadian astronaut Chris Hadfield and Tragically Hip frontman Gord Downie are among over 100 authors and illustrators nominated for the annual Forest of Reading Awards. The program is run by the Ontario Library Association and celebrates English and French literature for readers across all ages and reading levels. There are up to 10 titles nominated in each of the categories. Hadfield's nominated picture book, The Darkest Dark illustrated by Eric Fan and Terry Fan, is a finalist for the 2018 Blue Spruce Award, which targets readers from J.K. to Grade 2. The book follows a boy named Chris who must overcome his fear of the dark to pursue his love of space. Secret Path, Downie's collaboration with graphic novelist Jeff Lemire, is nominated for the Grades 7 and 8 Red Maple Fiction Award. The book tells the true story of Chanie Wenjack, who died trying to walk 400 miles home after escaping Cecilia Jeffrey Indian Residential School. Other titles nominated for the Red Maple Award include The Winnowing by Vikki VanSickle and The Way Back Home by Allan Stratton. The White Pine Award nominees, books for readers in Grades 9 to 12, includes The Marrow Thieves by Cherie Dimaline, a dystopian novel depicting the re-opening of residential schools. The book is also a finalist for the Governor General's Literary Award for young people's literature — text and the Kirkus Prize. The category also includes Dimaline's fellow Governor General's Literary Award finalist, Danielle Younge-Ullman for Everything Beautiful is Not Ruined, as well as award-winning authors Kenneth Oppel for Every Hidden Thing, Susan Juby for The Fashion Committee, Susin Nielsen for Optimists Die First and M-E Girard for Girl Mans Up. Gordon Korman is nominated for Restart, a chapter book about a boy named Chase who loses his memory after falling off a roof and hitting his head. The book is among the Silver Birch Fiction Award finalists, which is comprised of novels for readers in Grades 3 to 6. I Am Not a Number by Jenny Kay Dupuis and Kathy Kacer with illustrations by Gillian Newland is nominated for the Silver Birch Express Award. A tale of resilience and loss, the book follows a young girl who is taken from her family and stripped of her culture in residential school. The Silver Birch Non-fiction Award nominees include 5 Giraffes by Anne Innis Dagg, which won the $10,000 Lane Anderson Award earlier this year. The Forest of Reading has also recognized Joanne Schwartz and Sydney Smith's Town Is by the Sea, another Governor General's Literary Award finalist, for the Golden Oak Award. The category highlights books for new readers. The Forest of Reading bills itself as "Canada's largest recreational reading program" with over 250,000 readers participating through their school or public library each year. Those who read a certain number of books in each category will be able to vote for their favourites in April. The winners will be announced in May at the Festival of Trees, a two-day event in Toronto for young readers, authors and illustrators. CORRECTION: This article originally stated that Katherena Vermette was nominated for the Evergreen Award. However, Vermette's novel The Break had already won the 2017 Evergreen Award on Oct. 12, 2017.